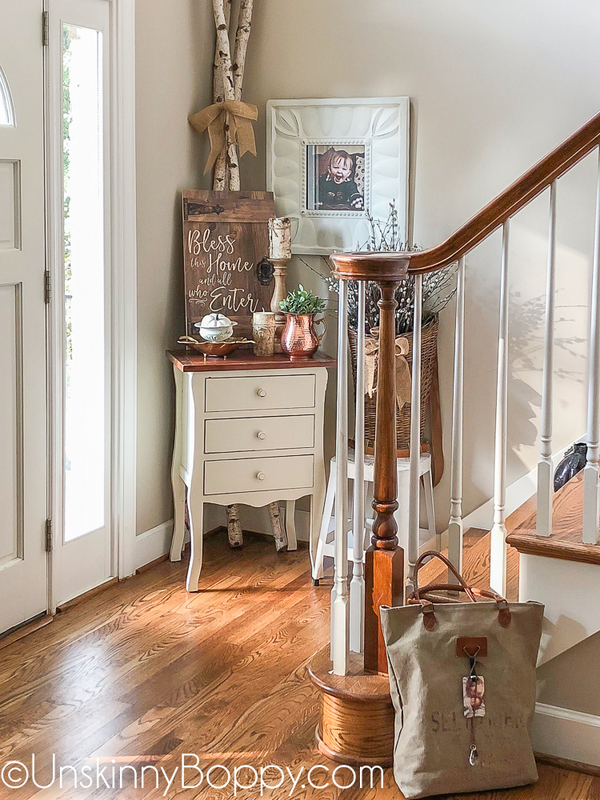 Welcome to my 2018 Fall Home Tour! 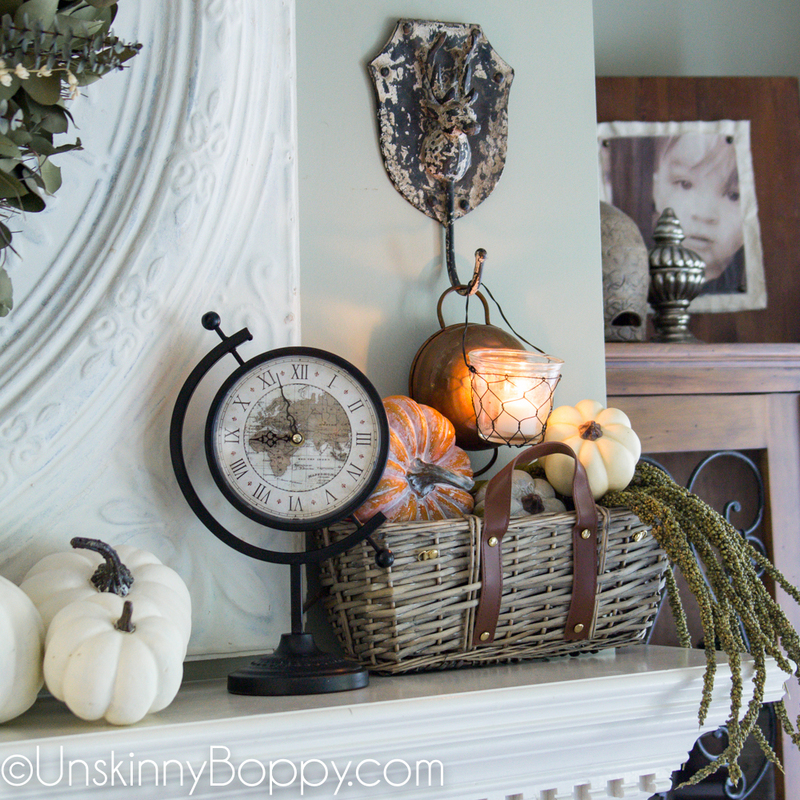 Today I’m joining 20+ blogging friends for a farmhouse fall blog hop. If you’re coming over from Twelve on Main, let me say a great big hello! Hope y’all are having fun taking the home tours! 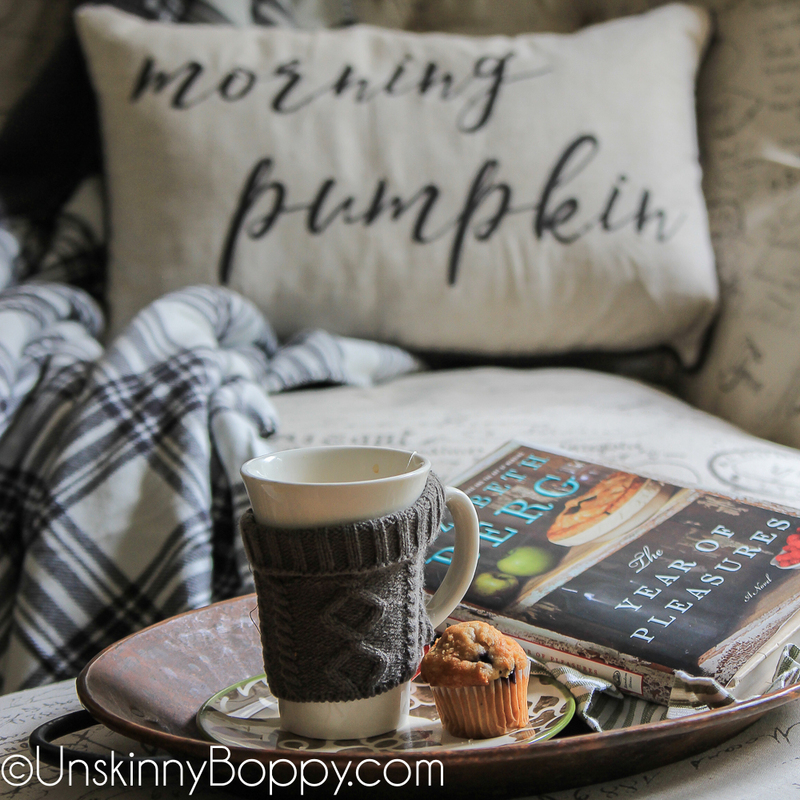 I have already shared a few of my fall decor posts so I’ll link them up here for you to go back and read if you’re interested. First up was this free Fall printable that’s on the apothecary table in my foyer. If you need some free fall decor, go print this off and display it somewhere in your house! 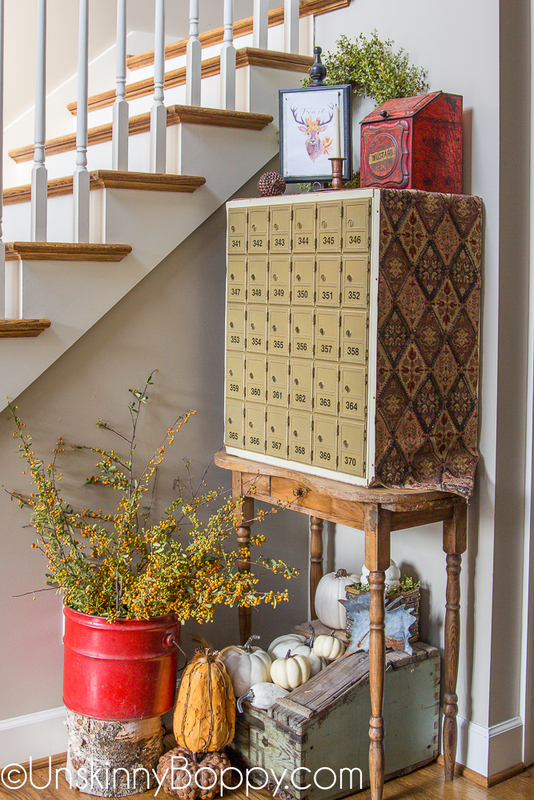 Yesterday I shared my newest addition to the foyer, this set of vintage post office boxes that I transformed into another display area in my foyer. I am in LOVE with how this little DIY project turned out! Y’all go read all about it right here, ok? I also added one more little vignette over at the bottom of my staircase, because why not. I do believe I have the fanciest falled-up foyer in all the land at this point. 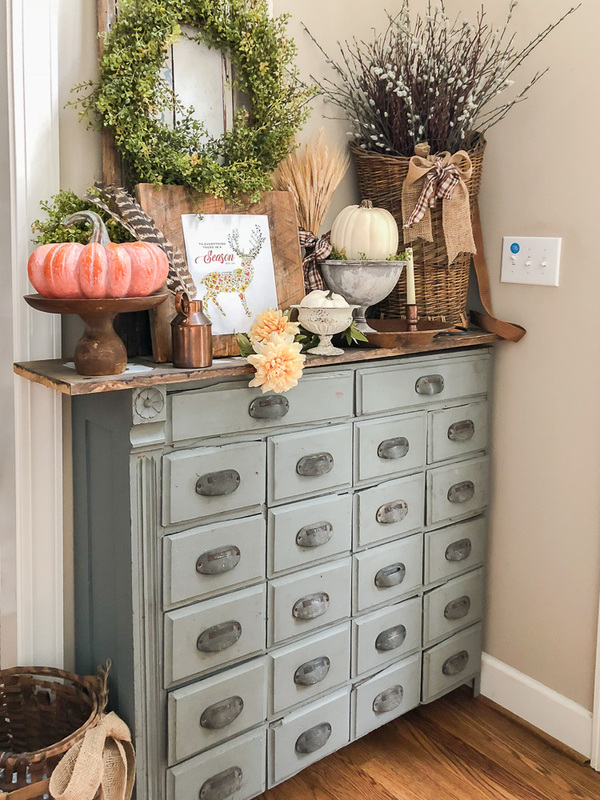 I know I signed up for a farmhouse fall home tour, but to be fair, I don’t think my home technically qualifies as a “farmhouse”. I mean, it’s a brick house that sits at the end of a cul-de-sac and I sure don’t have any chickens running around, but I like to think I’m somewhere in the farmhouse realm? Maybe? I dunno. I’ve always described my style as “Flea Market Fancy” so let’s just stick with that. I’m more of a traditionalist in my home decor, and if you haven’t noticed, I have this little problem with going overboard with my decorating. I like layer upon layer of decor with even more piles of chotchkes stacked on top. Too much is never enough. The more decor the better. I have the best of intentions. I scroll past all the other blogger’s feeds on Instagram and I truly WANT my home to be all light, white, and clutter-free. I tell myself every year that I’m going to scale it back, but then I pull out the fall decor bins from the basement and before I know it, every square inch of my house is covered in an explosion of pumpkins and wreaths. I just look around, shake my head and wonder why I cannot edit myself better. It’s like some kind of sickness. I have to display ALL THE THINGS. 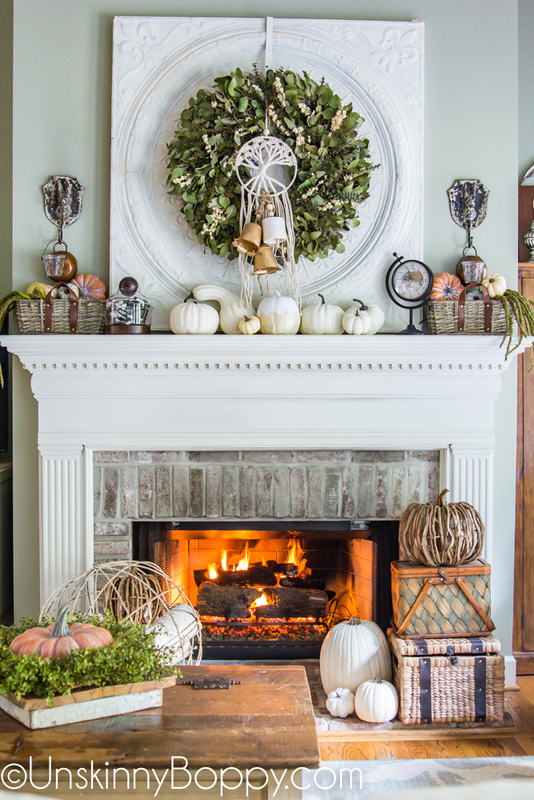 I mean, why use just one white pumpkin when you can pile your entire mantel full of ’em, amiright? It doesn’t help matters that I am a blogger and I get offers for free product all the time. To be honest, I turn down 98% of the offers that come through my inbox, but every once in a while something catches my eye and I decide to go for it. Today is one of those days. If you follow me on Instagram you might have seen my IG story from a few weeks back when I announced that I had accepted my very first sponsored post of the year. 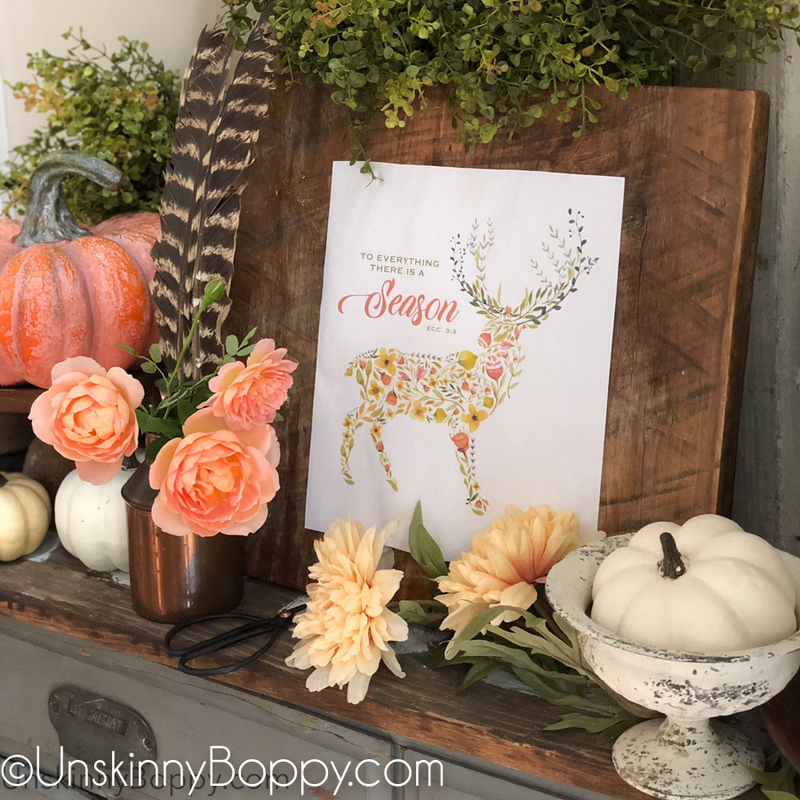 The friendly folks from At Home asked me to decorate my house using their fall decor, so this post is full of items that I found on a shopping trip to my local At Home store. Now imma be the first to admit that I never have been a fan of macrame, but I saw this tree of life macrame and it stopped me in my tracks. I kinda love it. I’ve seen something like this going for $70 on etsy, but this one was $7.99. Whoothoot! 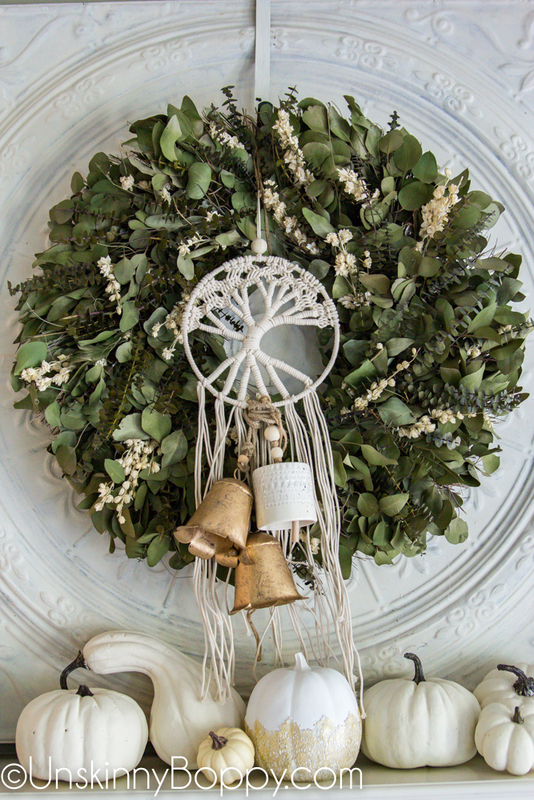 I also love that GIANT eucalyptus wreath and those little leather strapped baskets. Who am I kidding? I love it all. 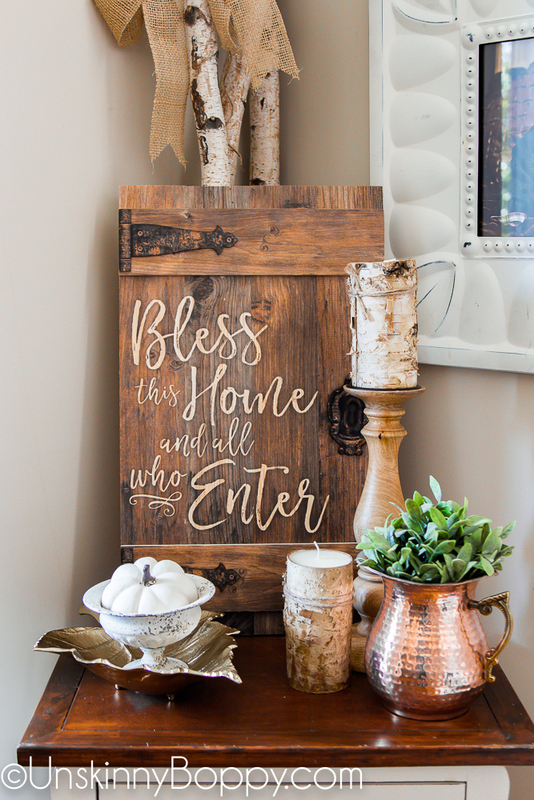 If you’re needing some new stuff to deck your halls for fall, be sure to check out At Home. 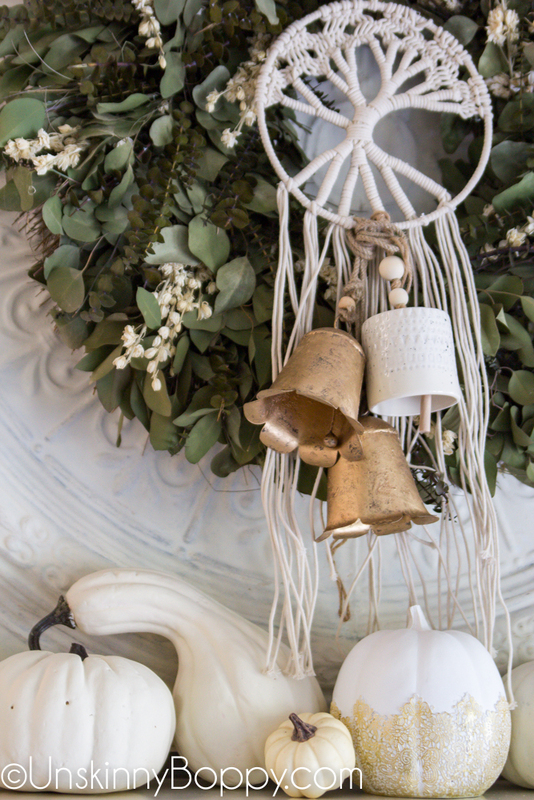 Especially fall wreaths… they’ve got about a gajillion of ’em. When I was editing these pics I noticed that my side chair in the corner was looking a little bit empty since I forgot to add a pillow when I snapped these photos. Whoopsies. 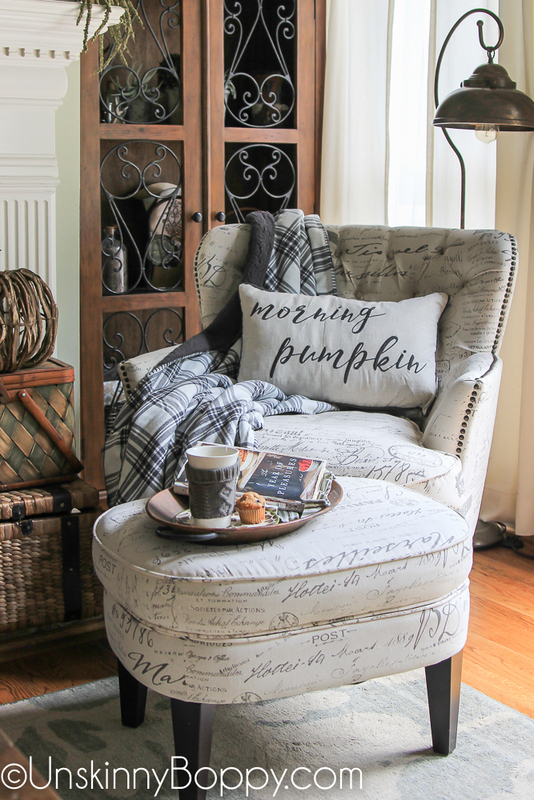 So this weekend I added a comfy flannel throw and a cute “Morning Pumpkin” pillow. And now it’s the perfect spot to snuggle up by the fire and read a book. Except that ain’t nobody in Alabama snuggling up by the fire anytime soon. It’s HOT out here, y’all. If I could turn the air conditioning down to about 60 degrees a fire might actually be bearable, but I can’t afford that power bill. The weather outside is nowhere near fall temps here in Alabama yet. We are currently hovering somewhere in the melt-your-face-off range. Which is why you will not see any pictures of my porches decorated for fall just yet. Nothing would survive the surface of the sun that is my front porch these days. But it’s still fun to get the inside all dressed up and pretend that it’s fall o’clock somewhere. 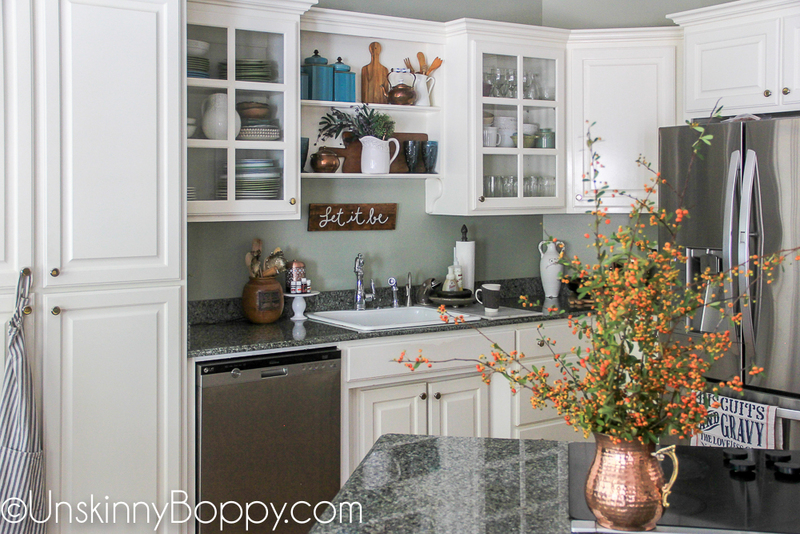 Since this post is getting WAAAAAYYY long, I’m going to stop right here with this little teaser of my kitchen and tell you to come back tomorrow for part two of my Fall home tour. I’ve gone a little crazy with the decor this year and it’s just too much to fit inside one post. Here are the links to all the blogs on the tour this year! Have fun! This post was sponsored by At Home, The Home Decor Superstore. I try to just call it At Home, but it sounds much better when I call it by it’s full legal name–At Home, The Home Decor Superstore. I was compensated for this sponsored post and bought myself some new fall decor because I can obviously never have enough. All opinions about weather, clutter, and macrame are my own. If you have an At Home, the Home Decor Superstore near you, you should totally check it out. Because it’s fall, y’all. Beth, your home is always so pretty! I love all of your fall touches. We had one of those old mailboxes! They are so much fun! I love where you put yours! Happy fall! Thanks so much Lindsay! That mailbox is definitely a keeper. I love it! 🙂 Happy fall to you as well. 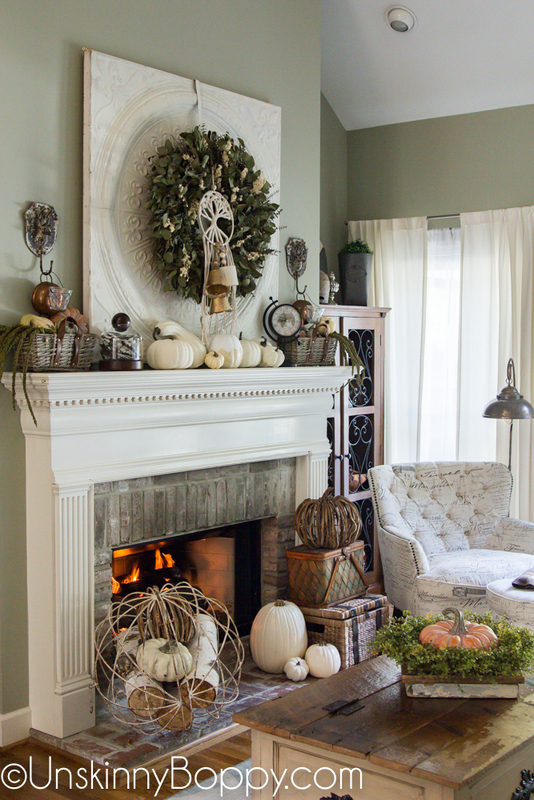 Beth, your fall mantel is gorgeous! I love all of the things too, and yours are styled perfectly. Also going to hop over and read about that cool vintage mailbox. I love all of your rustic, vintage pieces. Awwww Angie I appreciate your sweet words so much! I sometimes wish I could have a clean and simple style but then I start decorating and it all just makes me happy so I roll with it! Your home is absolutely beautiful! I love all your fall touches. It is so cozy and warm. The house looks beautiful! We are in Texas and it is pretty much surface of the sun hot here, too – cracks me up that you have the fireplace roaring! Thanks so much! Maybe one day the temps will drop below 175 degrees. Your house is beautiful! Love the ambiance of the fire going in the fireplace. I love that block of mail boxes! Thanks so much Tara! 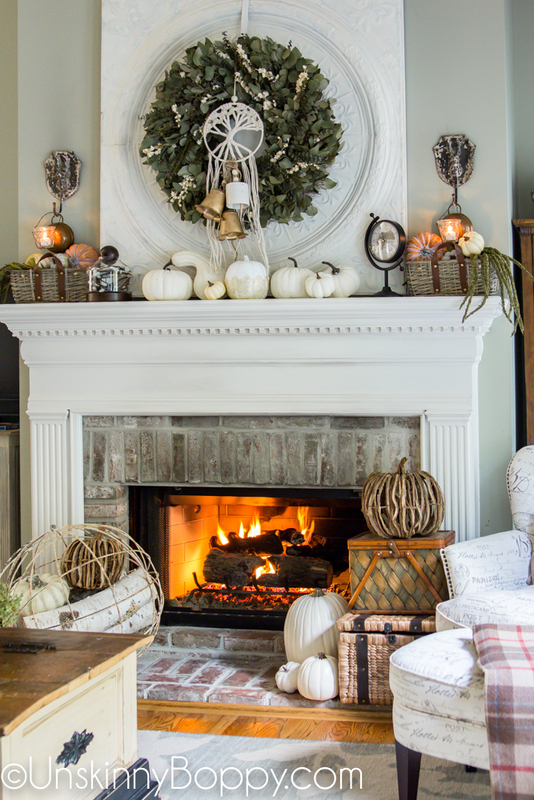 There’s nothing better to warm up a photo than real fire in a fireplace and lit candles on the mantel. Ambience is awesome! I love the touches of pale orange, so pretty! 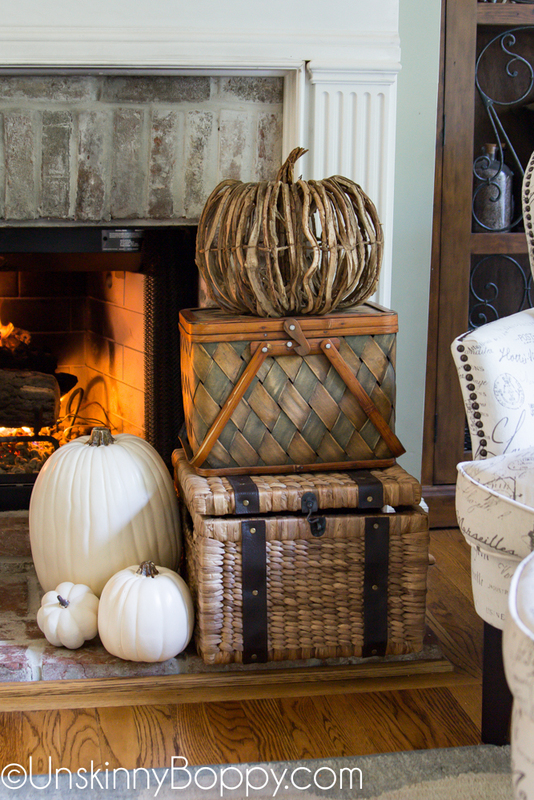 Your home is SO beautiful Beth and it all looks so cozy all decorated for Fall! Your fireplace is just stunning and I’m head over heels in love with all of those gorgeous cabinets!!! Awww thanks so much Kristi! Happy fall to you my friend! 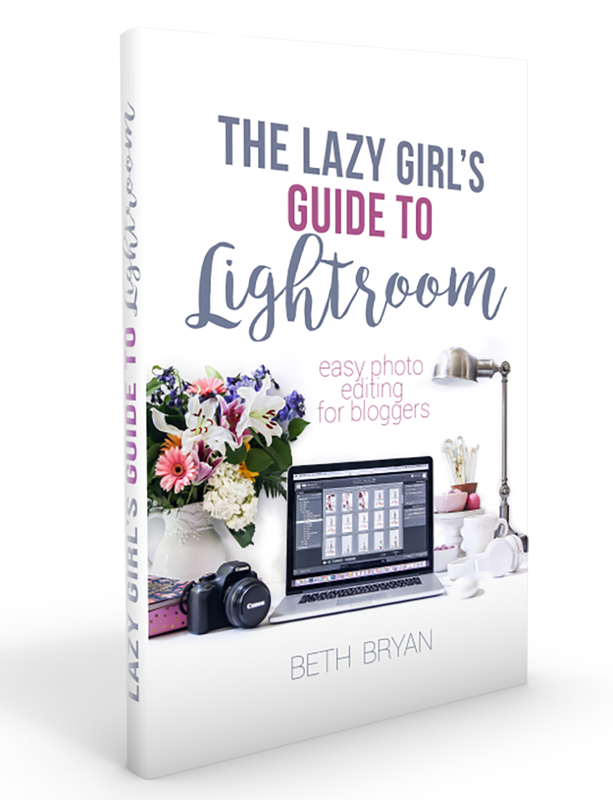 Beth – I love your style! I share the same ‘sickness’ of taking out and using all the really good stuff we’ve been collecting forever. I love how you use a nice mix of traditional fall colors and everything feels cozy. Thanks for letting us into your home! Thank you so much Traci! I sometimes wish I could reign it in a bit, but mostly I just give into it and display all of my treasures everywhere. 🙂 Thanks for stopping by! Beth, your home is stunning! 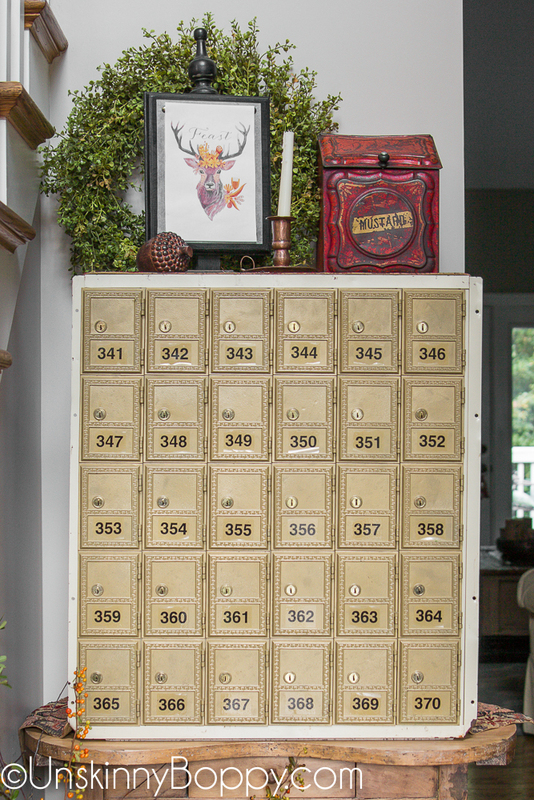 Those vintage mailboxes literally made my jaw drop. What a beautiful find! Also, the mantle is perfect and perfectly styled! I am dying to redo our fireplace surround and I adore your brick hearth. I’m un-dressed for Fall on the porch too, due to projects. I happily looked at all your layers and enjoyed them thoroughly. Nothing wrong with a naked porch when it’s hotter than the devil’s dinglehopper outside! Miss you my friend, thanks for your comment! Thanks so much Kelly! There was TONS of great inspiration on this hop! Glad to be on it with ya! Is there a new rule that says you can’t use it all? Love your fall spaces. Nice and cozy even thoguh it is Alabama hot out! I feel like the uncluttered style is all the rage but I will never not be cluttered. It’s just who I am! I’ve been ready for summer to end for months now! LOLOLOL! Fall is my fave, though. Maybe it will arrive, eventually! Hope you’re doing great, Ivory! Thanks for your comments. Your home is so cozy!! I love your fireplace! Looks so welcoming! The apothecary cabinet is styled so beautifully! Love touring with you! Thank you so much, Lindsay! Loved touring with you as well! Beth, your home is so cozy and welcoming! I love all your Fall touches. I love your Fall decorating, Beth. As always everything looks great! I usually tell myself I am going to do simple too but rarely do. This year Florence made me and while I love the simple look I kinda miss all my Fall decorations. Thank you so much, Leen! Glad Florence wasn’t too terrible on you this year. You can go all out for Christmas! Love everything you’ve done to make you home cozy. So many creative ideas there! I could hang out there all day long! I loved your tour, Beth! 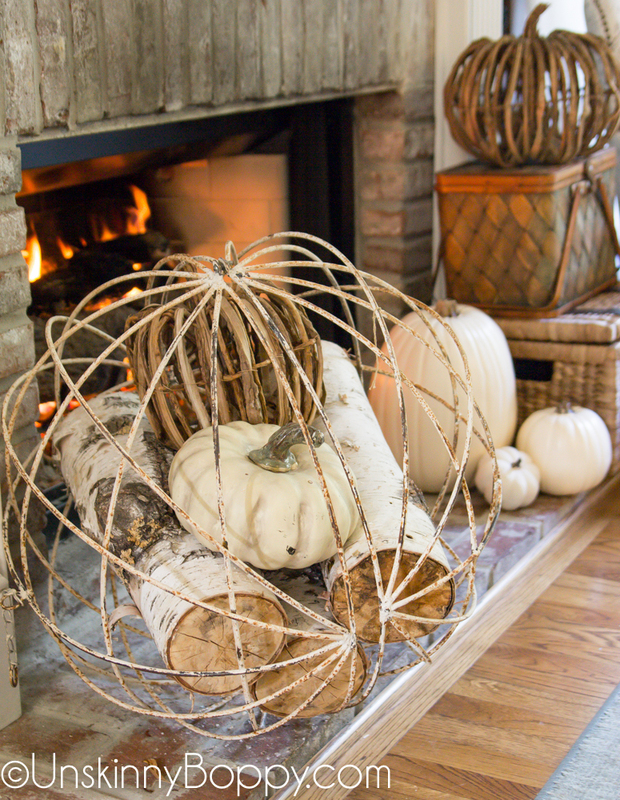 Your fireplace is a total showstopper!! Your house is so beautiful, wonderful tour! I love this color scheme, it looks so cheerful and bright.